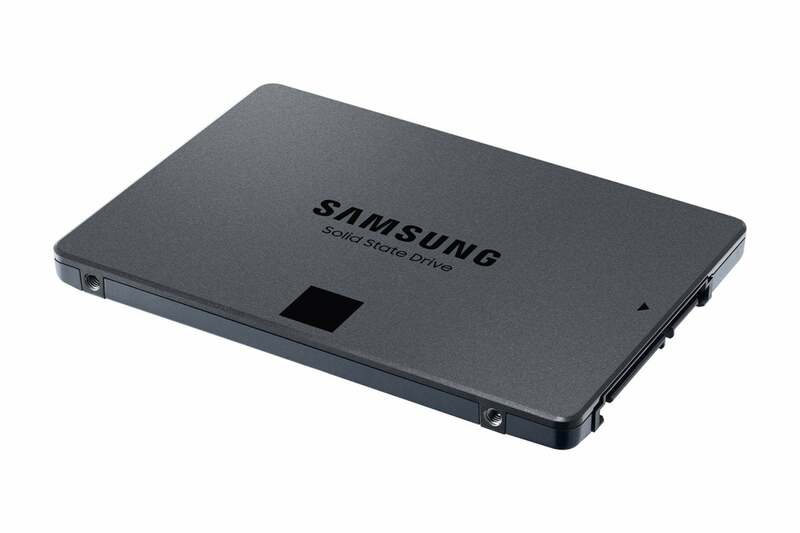 Samsung’s 860 QVO SSD is an excellent everyday performer and an outstanding bargain in its 2TB and 4TB flavors. It’s also the second quad-level cell (4-bit) SSD to pass our portals, the other being Intel’s SSD 660P. The reason I mention this competitive drive from Intel up-front is that it’s becoming clear that 4-bit NAND, while allowing greater capacity, also extracts a performance hit that vendors must work around. How well a vendor does that affects which 4-bit drive you should buy, and whether you might be better off with an MLC or TLC drive. Note: Samsung refers to the 860 QVO as 4-bit MLC. As the acronym MLC stands for “Multi-Level Cell,” this is technically correct. However, most refer to it as quad-level cell or QLC, which is what I assume the Q in QVO stands for. The 860 QVO is a 2.5-inch, 7mm thick, SATA 6Gbps SSD. 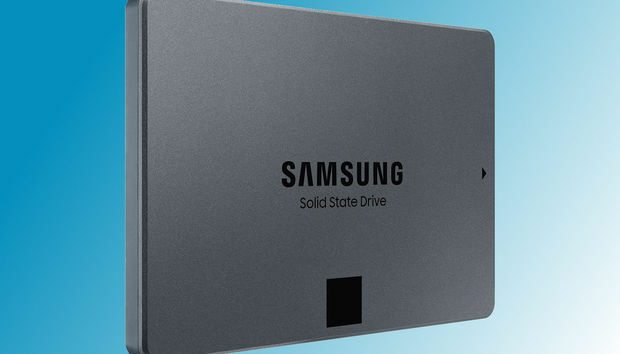 It’s a lighter shade of gray than most of Samsung’s SSDs, and will be available in four capacities: 1TB, 2TB, and 4TB. That last is a boon of 4-bit NAND: greater data density than 3-bit TLC, so you can fit more data in the same number of chips. The 860 QVO is thin, light, and a bargain in its 2TB and 4TB capacities. The drive provides 1GB of DRAM cache for each 1TB of capacity. The TBW (TeraBytes Written) rating is 360TB for every 1TB of capacity. The 1TB version I tested has approximately 42GB of available secondary cache (QLC, written as SLC or MLC). The 2TB and 4TB drives each get 78GB of cache. Pricing starts at $150 for the 1TB drive. The 2TB comes in at $300, and the 4TB model costs $600. 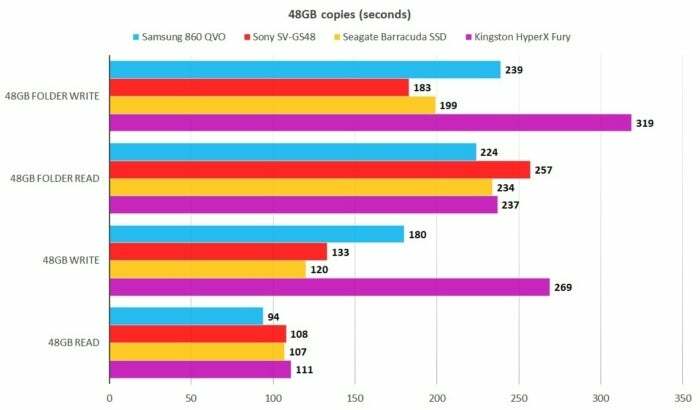 A 4TB SSD for $500 is dirt-cheap compared to everything else on the market, as well as what you would’ve paid only last year. The plain fact of the matter is that writing more bits to a NAND cell takes more time. It’s not that SLC NAND cells are so much faster than TLC or QLC cells, it’s that writing only one bit is faster. Write only one bit to TLC or QLC, and they’re nearly as fast. Write three or four bits, and they’re not even close. Hence a certain amount of the TLC (or QLC in this case) of any SSD is treated as SLC or MLC to form a secondary cache. Using this secondary cache—again, approximately 42GB—the 860 QVO proved a very good performer in most circumstances, as you can tell from the benchmark results below. There were no performance slowdowns until our 48GB file copy tests, in which the last 4GB or so wrote at only 70MBps. This would not occur in the 2TB or 4TB drives, with their more bountiful Level 2 cache. The 860 QVO (blue bars) is more than competitive with other drives in CrystalDiskMark 6. Longer bars are better. AS SSD 2.0 had roughly the same opinion as CrystalDiskMark about the 860 QVO’s speediness. Note that this test isn’t as optimistic about the throughput, erring slightly on the low side of what we see in our real-world, 48GB copy tests. 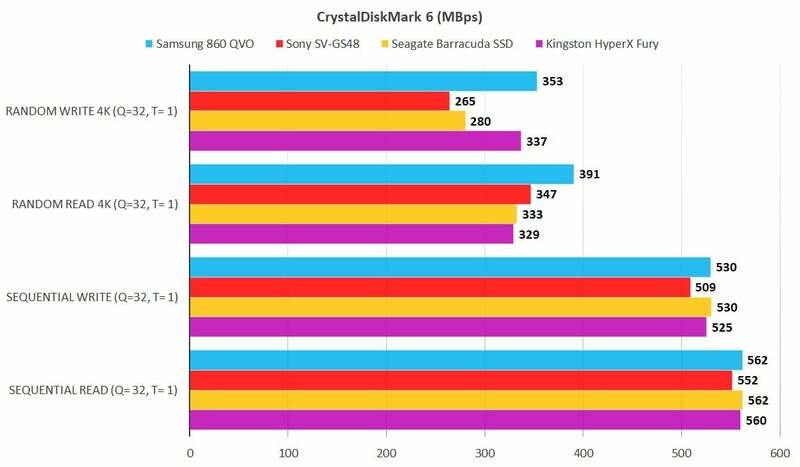 AS SSD largely agreed with CrystalDiskMark: The 860 QVO (blue bars) is fast under most circumstances. Longer bars are better. 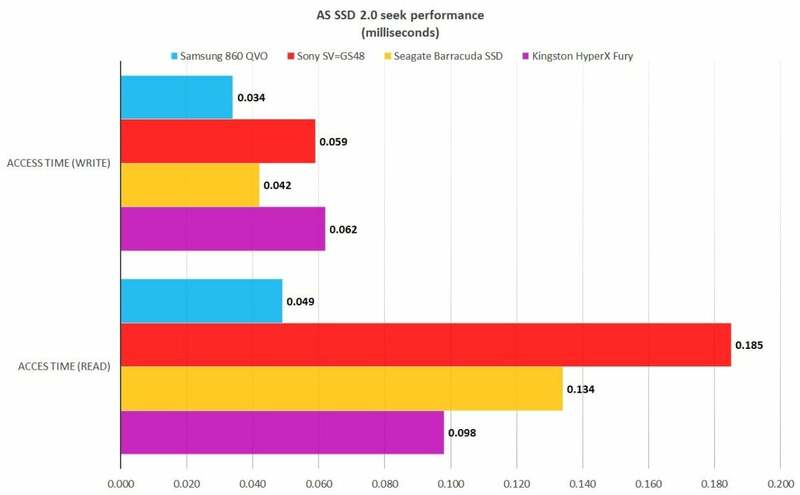 Seek times, as shown below, are actually quite quick compared to most SATA 6Gbps SSDs. This may have something to do with the previously described and generous allotment of DRAM cache. 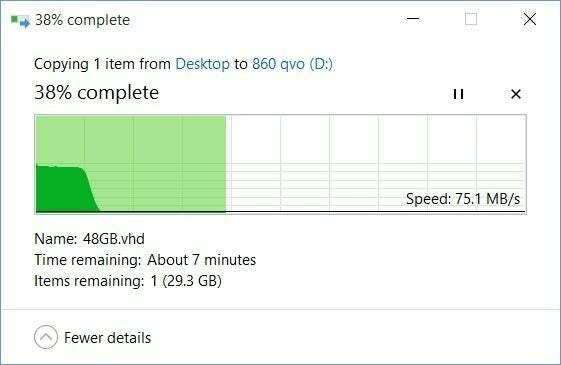 The 860 QVO’s (blue bars) seek times even faster than you’d expect from a SATA 6Gbps SSD. Shorter bars are better. Below you can see that the copy tests were only mildly affected by the 860 QVO’s running out of cache, but that was only because such a small amount of data was written to the main body of QLC memory. Double this test size, and the 1TB 860 QVO and Kingston’s bars would’ve been far longer than the Sony’s or Seagate’s. Even the 2TB and 4TB capacities would run dry in that scenario. The area where the 860 QVO (blue bars) falls short is in writing large amounts of data, a trait it shares with the Kingston HyperX Fury (purple bars). The more data you write, the worse the times will be. 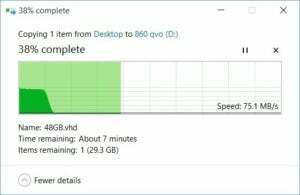 The pace of the 860 QVO hovers around 70MBps once the cache is overwritten. Shorter bars are better. When the 860 QVO runs out of cache, it’s pretty depressing. The drive will clear the cache by writing the data to the main body of 4-bit NAND, but that process takes a while. I waited a good ten minutes between tests. Below you can see what happened when I didn’t wait that long to try copying 48GB one more time. The original 48GB copy didn’t slow down until about the 90-percent mark. This is what it looks like when the 860 QVO slows down. Note that this is a second copy. The initial 48GB didn’t slow down until about 90% of the way through the copy. Just by way of comparison, in terms of sustained throughput, we’ve seen hard drives clock 250MBps. 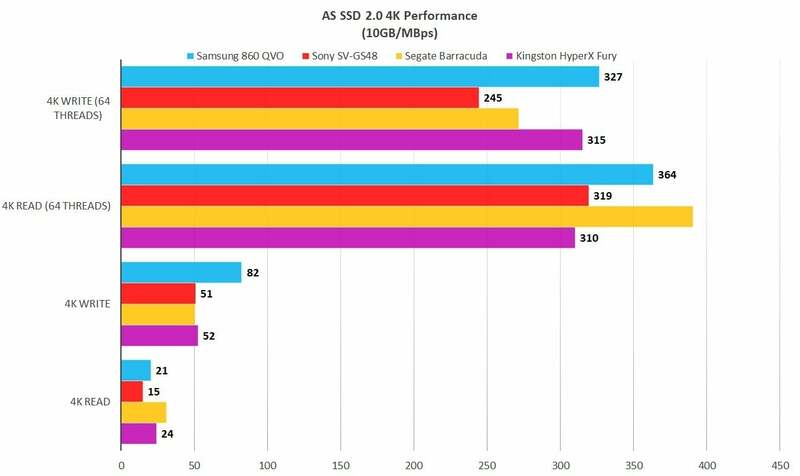 But even when writing slowly, SSDs retain their super-fast seek times. Also note, this is strictly about writing. NAND read speeds in SATA SSDS remain quick no matter what the number of bits being read. The 860 QVO is a great SSD most of the time, but there are a number of cheaper 1TB competitors that don’t slow down. The 2TB and 4TB drives, on the other hand, are a couple of hundred dollars less than the competition and don’t fall out of cache nearly as soon. That’s a big-enough price difference that I’d consider the trade-off, which will vary in balance depending on your needs, worthwhile. Bargain or not, know that you will see a massive drop-off in performance when the drive runs out of cache. It doesn’t run out often, but it’s ugly when it does.